1. Tongues was prophesied in the O.T. to be manifested in the N.T. (Isaiah 28:11-12). 2. Jesus said that tongues is a sign that would follow the believers (Mark 16:17). 3. One who speak in tongues could speak with both tongues of men and of angels (1Corinthians 13). 4. Tongues is an evidence of being filled with the Holy Spirit (Acts 2:1-4). 5. Tongues is a way of communicating hidden secrets with God (1Corinthians 14:2). 6. Tongues is a way of building up yourself strong and charging up your spirit like a battery (1Corinthians 14:40). 7. Paul speaking by the Holy Spirit desired that all believers would speak with tongues (1Corinthians 14:5). 8. Tongues when interpreted is equal to prophecy (1Corinthians 14:5). 9. Tongues is the way the believers’ spirit prays, the language of the spirit (1Corinthians 14:14). 10. What is prayed in tongues can be prayed back in understanding to edify the soul (1Corinthians 14:15). 11. Tongues is a way to speak unto God (1Corinthians 14:2). 12. One who speak in tongues can equally sing in tongues and do it back in understanding (1Corinthians 14:15). 13. Tongues is a gift worthy of appreciating God for and it is one thing that you can do more than others to your own spiritual advantage (1Corinthians 14:18). 14. Tongue speaking is a fulfillment of prophecy (1Corinthians 14:21). 15. Tongues are signs to unbelievers (1Corinthians 14:22). 16. Paul by the Holy Spirit said that tongues shouldn’t be forbidden (1Corinthians 14: 39). 17. Tongues is a way to pray, a supernatural prayer language (1Corinthians 14:14). 18. The one who prophecies without speaking in tongues is like the Shulamite wife of King Solomon who tended others’ garden without tending her own. Prophecies build others but tongues build you up to build others (1Corinthians14:4; Songs of Solomon 1:6; 6:13). 19. Tongues is how to pray in the Spirit and it is one way to embolden or strengthen one’s faith life because it takes faith to talk in tongues (Jude 1:20; Romans 12:6). 20. Tongues is a doorway to other spiritual gifts such as prophecy (1Corinthians 14:13). 21. Tongues keeps us in constant awareness of the love of God (Jude 1:20-21). 22. Paul spoke by the Holy Spirit that we should pray all prayers in the Spirit and tongues is the way to do that (Ephesians 6:18; 1Corinthians 14:14). 23. Tongues speaking remind us constantly of the indwelling Spirit of God, it is a communion with the Holy Spirit (1Corinthians 3; 16; 6:17). 24. Speaking in tongues is one way to give thanks to God (1Corinthians 14:17). 25. Tongues is a way to pray when we do not know what to pray as we ought to (Romans 8:26). 26. Tongues is a way to submit our tongue to be tamed by the Holy Spirit (James 3:8 ). 27. Tongue is a way to increase spiritual sensitivity, it is a wisdom the Holy Spirit teaches (1Corinthians 2:13). 28. Tongues is a way to tap into supernatural knowledge and address issues directly (Romans 8:26-28). 29. Tongues is a way to pray without having to think (Romans 8:26-28). 30. Tongues is a way to activate the intercession of the Holy Spirit (Romans 8:26-28). 31. Tongues is a way to get into the deep things of God (1Corinthians 2:10). 32. Tongues is a way to pray hundred percent will of God (Romans 8:27). 33. Tongues is a way to overcome praying amiss or selfishly (Luke 4:3). 34. Tongues can help overcome fear because it reminds you of God’s presence within (2Timothy 1:7). 35. Tongues activates the ministry of angels because one can speak in angelic tongues (1Corinthians 13:1). 36. Tongues helps you to pray longer (Ephesians 6:18). 37. 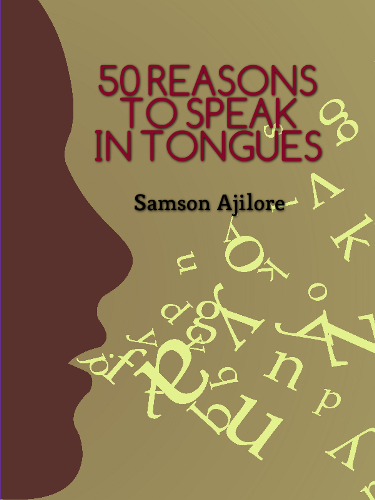 Tongues helps to bypass the limitations of the human soul in prayers (Romans 8:26). 38. Jesus commanded us to receive the gift of the Holy Spirit and tongues is the initial manifestation of that gift (Acts 1:4-7; 2:4). 39. Jesus said that God is a Spirit and must be worshiped in spirit and truth. Tongues is a way to have spirit to Spirit communion with God (John 4:24). 40. Tongues is one way to pray without ceasing (1Thessalonians 5:17). 41. Tongues is spiritual rest. It is a way to overcome anxiety (Isaiah 28:11-12). 42. Tongues is a way to stir up the gift of God in you (2Timothy 1:6). 43. Tongues strengthens the believers’ spirit (Ephesians 3:16). 44. Tongues is a way to be spiritually minded (Romans 8:6). 45. Tongues is a way of spiritually fine-tuning for God’s voice (Revelation 2:7). 46. Tongues is a way of spiritual fitness (Proverbs18:14). 47. Tongues impart supernatural boldness (2Timothy 1:7). 48. Tongues is a very great intercessory tool (Romans 8:26-28). 49. Tongues is spiritually refreshing (Isaiah 28:11-12). 50. Tongues enhances deeper insights and understanding of the Word (1Corinthians 2:10).